Get Christian parenting advice and help for raising children at Crosswalk.com. Biblical principles for Christian families and resources for new parents, and single parents. Find resources to help you raise your children according to the Bible and Jesus. On Crosswalk you will also find great resources on homeschool and Christian college. The toddler throws herself on the floor of the bread aisle in the grocery store, her face red, her small fists pumping in the air and her feet pounding the ground. Screams of rage and frustration emanate from the tiny body. A toddler in the throes of a temper tantrum is never a pretty sight, but add a public venue to the incident and the tension increases exponentially. When you’re the parent with a screaming child in a store or restaurant, the last thing you want is to be accosted by an unsympathetic stranger. Here are six things you should never say to the mother of a screaming toddler. 1. “You really should...” Nothing good will come of starting a conversation with a mother of a young child throwing tantrum by telling her what she should do. Believe me, she knows and has probably tried your suggestion. 3. “Get control of your child.” That’s akin to saying “Why can’t you wrestle a wild lion with your bare hands?” to a mother with a screaming toddler. Toddlers cannot be reasoned with and sometimes, there’s literally nothing that can be done until the child has worn himself out. 4. Threatening the child with Santa Claus or other authority figures. Telling the crying kid that “Santa Claus is watching you” can easily backfire and send the child into fresh wails of anguish. 5. Throwing the mother dirty looks or whispering comments. Believe me, the mother feels judged enough without strangers giving her disgusted looks or talking with a companion about how the mother’s handling the screaming toddler. She’s already feeling the center of heated attention—don’t make her feel even more terrible. 6. “Can’t you take him outside/away from here?” Well, maybe, but if the mother has other children with her, or has a grocery cart full of items, she might not be able to up and leave the area immediately. She also might not be able to physically pick up the child and a yelling, wiggling mass of toddler weighs a lot more than a cooperative kid the same age and size. 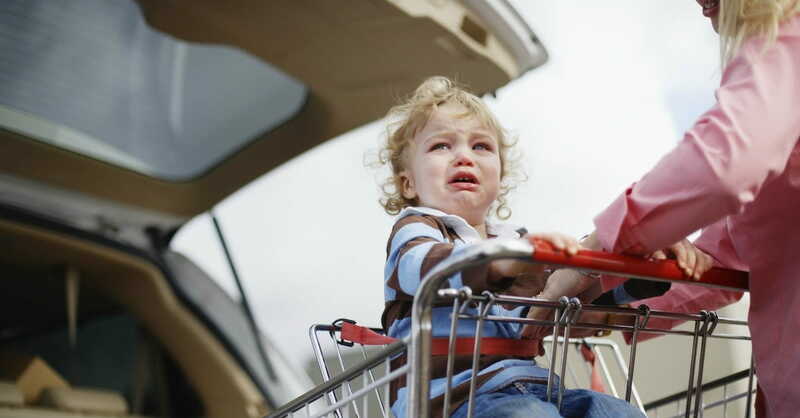 As we’re out and about, chances are that we will all encounter a mother with a screaming toddler. How we react can make a huge difference to the mom and the child. Joy Wycoff of Mooresville, North Carolina, looks for opportunities to offer assistance to mothers of young children. “At one time, I was the mother of young children as well and did not always have a kind person offer to help when it was needed,” she said. Here are four simple ways you can help a mom in a similar situation. 1. Compliment the mother on how she handled the situation. One mom related that when her boys behaved badly in a store by running around and hiding in racks of clothes, she had them line up against the wall while she checked out. As she was leaving, another woman said to her and her boys: “Boys, be kind to your mom. She loves you very much and is doing a great job.” A simple statement turned this mom’s bad day into a good one. 2. Look for ways to encourage a mom with young kids. When one of her daughters threw a temper tantrum in a store, someone came up the mother after the toddler had calmed down to say, “You handled that nicely.” “Not only did it diffuse the situation in the store, it also reinforced that my method was correct at that time,” this mom said. 3. Offer assistance. So often we look away from the scene, sometimes out of embarrassment, sometimes to avoid saying the wrong thing. But there are simple ways to offer help. You can unload her groceries on the conveyor belt, save her place in line so she can address the toddler, watch her bags while she takes the child off to a corner or the bathroom, smile at her instead of frowning. One mom toted around coloring books and small bags of crayons to hand out to moms who needed a distraction for their children, such as at a restaurant or waiting in line. These small gestures can change how the mother views the situation. 4. Be sympathetic. We’ve all been in a similar situation, so tell the mother to hang in there, that this will pass, that it’s okay, that we’ve all been there and that she’s doing just fine. Hearing the sympathy from another mom can ease the situation. It can be difficult enough being a parent these days, but throw in screaming toddlers, and even the most relaxed mom will come undone. By remembering that sometimes young moms need a helping hand from an older woman (Titus 2) or peer, we can make her day a little bit brighter. A certified Leadership Parenting Coach,™ Sarah Hamaker has written Ending Sibling Rivalry: Moving Your Kids From War to Peace. Her blogs on parenting have appeared in The Washington Post’s On Parenting, and she’s a frequent contributor to Crosswalk.com. Sarah lives in Fairfax, Va., with her husband and four children. Visit her online at www.parentcoachnova.com and follow her on Twitter @parentcoachnova.